All too often a company’s annual business review (ABR) takes the form of the president or CEO tediously going through the numbers to an audience that is widely disinterested as they sit there thinking about the holiday party, their own year-end review or something else entirely. This is a wasted opportunity. One of the most important goals of an annual business review presentation is to build a shared sense of community. A good annual business review offers the chance for everyone to see their efforts in context, to view themselves as part of a larger, meaningful effort and to understand the company’s shared goals. We’ve put together an ABR worksheet to help you organize your annual business review so that you can make the most of the opportunity. The worksheet helps you clarify your storytelling so that your audience will stay engaged and leave with a clear understanding of your central messages. But before we talk about content, there are a few general presentation tips that can really help you do your best. Every year giving a presentation gets harder as audiences become more and more used to doing three things at once. As we become more used to the instant gratification of a constant stream of information over our electronic devices, the simple task of sitting still and listening becomes more difficult. Have everyone in the room turn off their phones (except Security). Now that everyone is paying attention, you have a precious couple minutes to make them care about what you are saying. They key to this is to speak about what is important to them. Find the intersection between what they want to hear and what you need to tell them. Treat your audience with the same respect for their time and attention you would show to your board members. Show them that you value their time by keeping your talk as short and on point as possible. Long, meandering remarks or tangential anecdotes undermine your presentation and tacitly signal your audience that this isn’t important and they are free to think of other things. Your job is to steer the ship, not memorize the last thirty readings of one of the oil pressure gauges in the engine room. Remember that the audience you are addressing probably knows every facet of your business more intimately than you. That is a great source of knowledge and intelligence, but it also means that they know when you are lying. Be honest. Be direct. Remember that any time you stray from the truth, they will know. The moment they sense you are being disingenuous, they will stop listening to you, and worse, they will stop trusting you. Keep it positive. Being honest doesn’t mean you have to be depressing or critical. Focus on the things that your company is doing well. As you prepare your presentation, ask yourself, “What are we doing right and how do we build on it?” This is an excellent opportunity to call out individuals or teams who have made an exceptional contribution over the past year. Remember, one of the goals here is to build esprit de corps to help motivate your audience going forward. Even in a difficult year, throwing the spotlight on successes will help you achieve more than pointing out failures. That said, sometimes you have to acknowledge setbacks so that your audience knows you are aware of them and doing something about it. If your situation requires you to talk about a difficulty, speak to what you learned from it and what you are doing differently to make sure that future results are better. Even setbacks have their upsides. Find them and share them. The 15% of your audience who really understand the numbers already know them. We are used to thinking that in business, it’s all about the numbers. But in reality, the numbers are secondary to the story that they tell. Focus on the story and use numbers as proof points that make the story believable. Basically, an annual presentation has four parts: an Overview, Our Actions, the Result and Our Plans. In other words, a little context and then a quick look at the past, present and future. The key to creating an effective annual business review is both the content and how you deliver it. 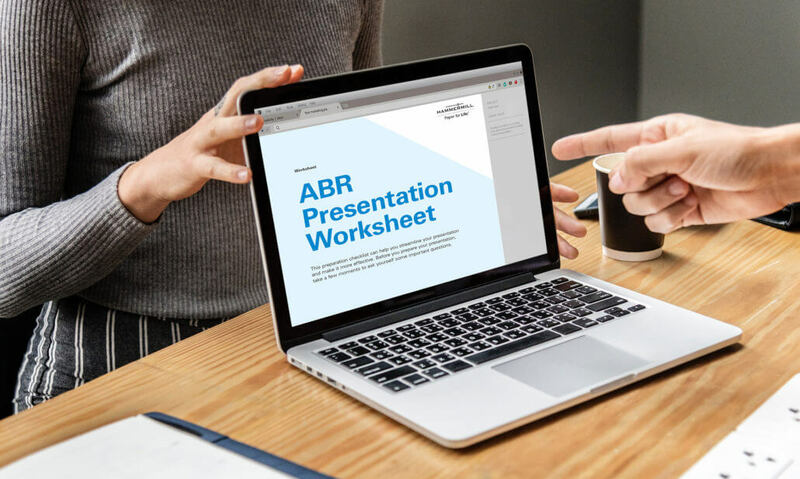 The ABR Worksheet can help you clarify your content and make sure your delivery is streamlined and engaging. The time you spend in preparation is well worth it and the difference it can make to your business is significant. The annual business review presentation is an opportunity to clarify and communicate your company’s goals and build team spirit to achieve them. When the presentation is over your audience should leave with a clear understanding of what has happened over the past year, where you are now and the goals for the year ahead. Now they are free to turn on their phones and think about the holiday party. Be sure to take a look at our blog post on How to Structure a Presentation for some essential tips on how to engage your audience and keep them interested. You can also search Hammermill.com for more content about organizing and giving presentations, conducting year-end reviews, branding basics and other important subjects that can help you build a stronger business. If you’d like to hear about upcoming content from Hammermill, be sure to join our mailing list!